Compact Gaming by Dell. Dell's XPS logo indicates highest performance and first-class design by Dell. Regardless, whether you look at 17 inch DTR gaming notebooks or at the compact Dell XPS M1530, you can be sure that XPS notebooks by Dell are always equipped with up-to-date hardware and, so, provide first-class performance. So, it's not surprising that the Dell XPS M1530 is also a very powerful multimedia notebook, which sets a high standard for competitors. Core 2 duo CPU and Geforce 8600M GT with GDDR3 memory in a high-quality and compact 2.6 kg aluminum case: Is there anything left to be desired? We first saw the new XPS design, when we reviewed the 13 inch Dell XPS M1330, which is a smaller version of the M1530. On the contrary, the Dell XPS M1730, a 17 inch DTR gaming notebook comes with a design completely different to its smaller competitors. It basically tries to attract attention by LED illumination. 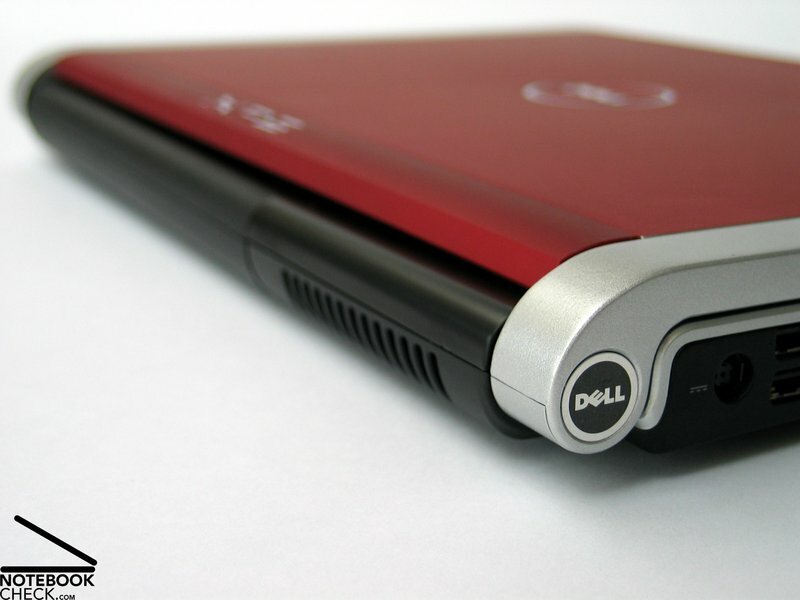 The design of the Dell XPS M1530 is completely different. It is very thin and extremely elegant. The base unit gets smaller at the front edge and appears even slimmer due to beveled flanks. Overall, this notebook appears to be very compact: The total size of the M1530 is only 358x262 mm, its maximum height 39 mm. Weighing only 2630 g this notebook is adequately fit for mobile work. 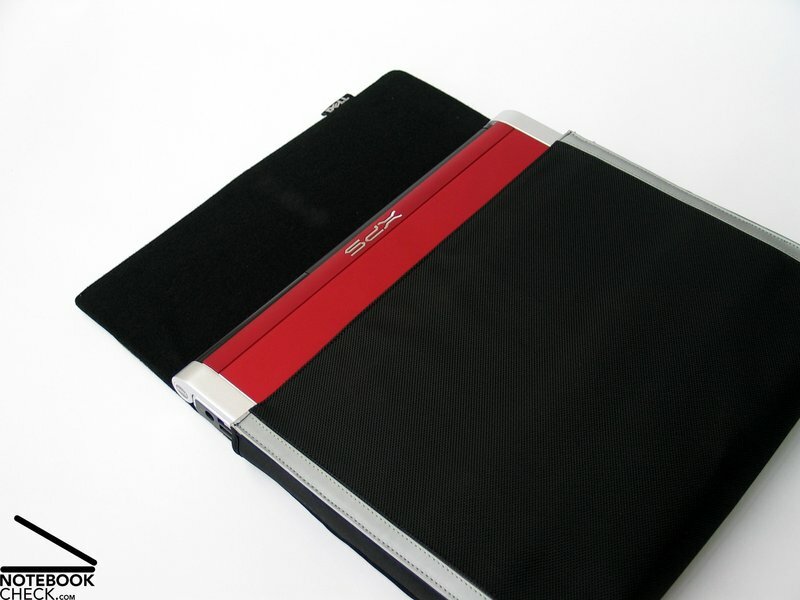 The hinges are located at the notebook's flanks and merge nicely into the display. Although it is not possible to completely open the lid, the maximum opening angle of 160° should not cause any problems. However, after adjusting the display's positions you can observe a slight see-saw. The back side of the display is covered by a big red inlay whose haptics is very nice. You can also choose a black lid which is offered as alternative to the red version when configuring your notebook on-line. Instead of providing a transport hook only the hinges keep the display closed. This made a special slim design of the display's front edge possible, whereas a decent chrome molding makes opening the notebook easier. Here the chosen material is also very important. Let's start at the notebook's bottom side. 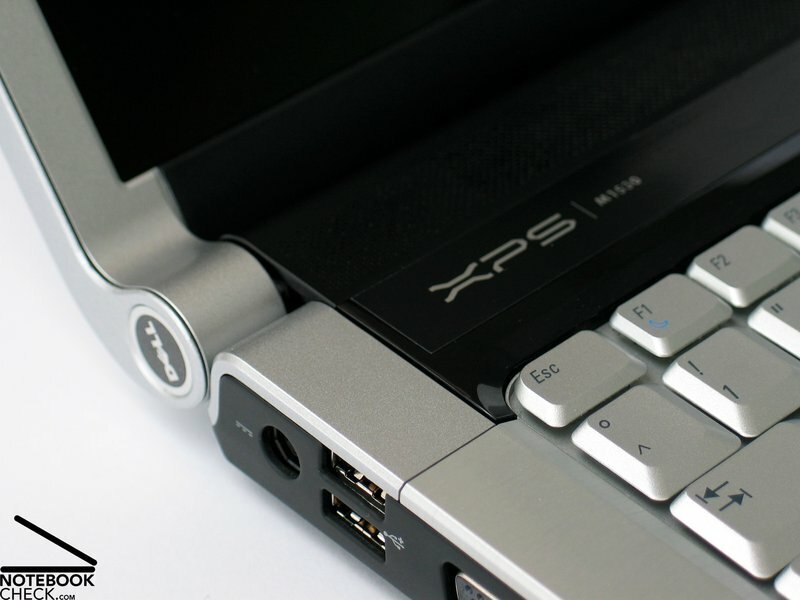 The XPS M1530's black trough is made of a combination of aluminum, magnesium, and steel parts. So, the XPS M1530's case has an excellent stability and is very pressure resistant and flexural rigid. The haptics of the surface feels also good. The palm rest areas are embellished by big aluminum part. Its brush-finished surface feels good. Metal parts were also used to improve the haptics of the display. 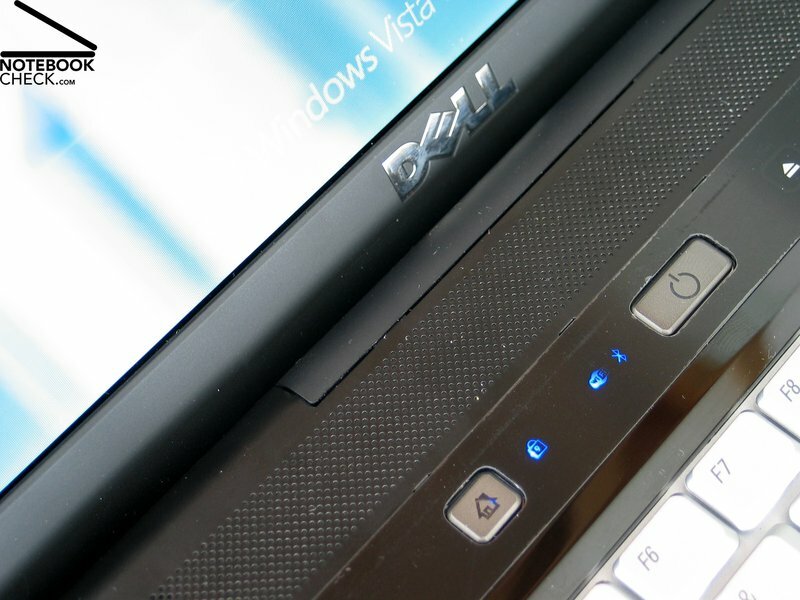 To summarize it, we got a notion that the Dell XPS M1530 is of high-quality. While there are neither weaknesses regarding stability of the base unit nor of the display, scrutinizing the case, we found some smaller deficiencies regarding workmanship, e.g., uneven gaps, especially, where parts of different material get in contact, and next to the hinges and the battery. Furthermore, the plastic part next to the right hinge wobbles a little bit. Although these are minor problems, they ought to be mentioned. Regardless of the chosen color (the lid can be black or red without extra charge), a 2.0 megapixel web cam is provided in the upper display frame. 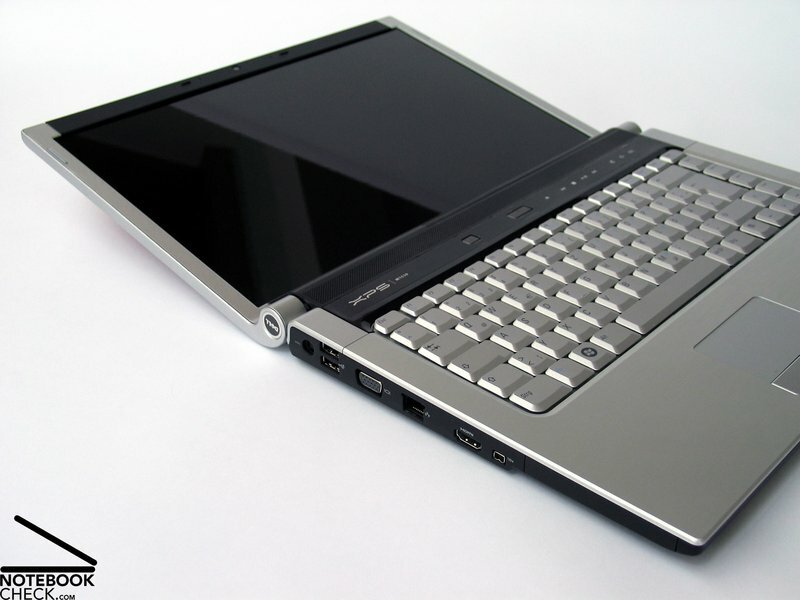 The reviewed notebook was also equipped with a fingerprint reader, which makes it possible to scan the fingerprint instead of typing a password. The Dell XPS M1530 also comes with a lot of accessories. E.g., there is a wrapper, which make it possible to easily transport the notebook. However, it's can only take the notebook itself. There isn't even enough space left for the power adapter. Besides some tools and driver software, also an operating system (Windows Home Premium on a DVD) is included. But this still is not all. 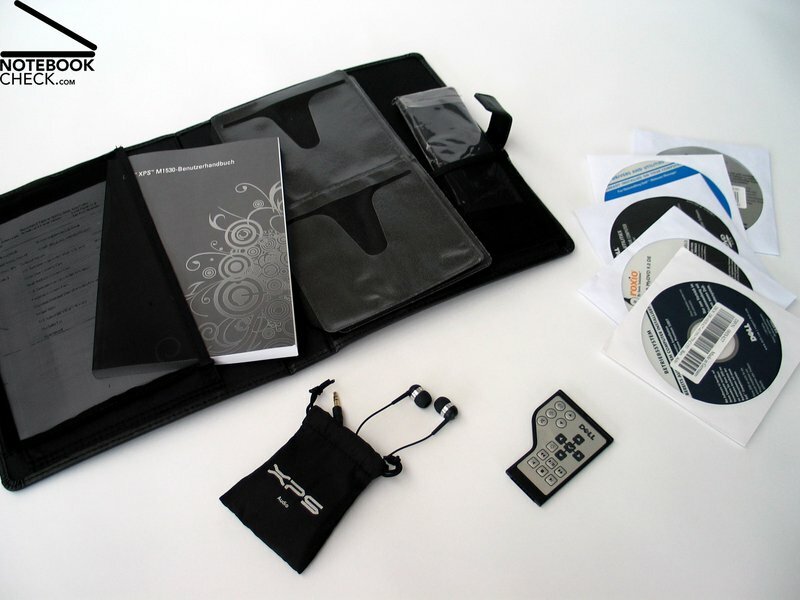 In order to provide a special incentive for XPS buyers, an elegant briefcase for the provided CDs and the comprehensive user manual is included. A remote control of ExpressCard size, headphones by Creative, and also a micro fibre cloth for cleaning the notebook are also amongst the accessories. Because display's release mechanism, most of the interfaces can be found at the left and the right side of the case. But, you'll find everything required for a useful multimedia notebook. There are a total of 3 USB 2.0 ports, two of them at the right side, one at the left side near the back. Furthermore, a S-video and a VGA port, a Firewire port, and a HDMI port, which makes connecting an external high-resolution display and transmitting digital video and audio signals possible. Due to the chosen design, there wasn't too much space available at the flanks. Still, the designers tried to locate the ports near the back. 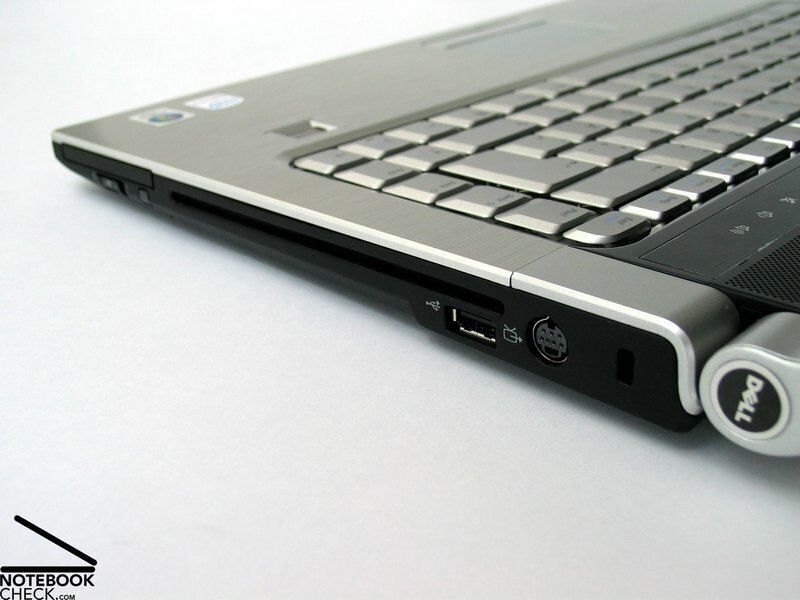 The hard disk is at the left side near the front, whilst the right side provides an ExpressCard slot and a Slot-In DVD drive. So, annoying cable spaghetti can be more or less avoided. prevented by it in the main. 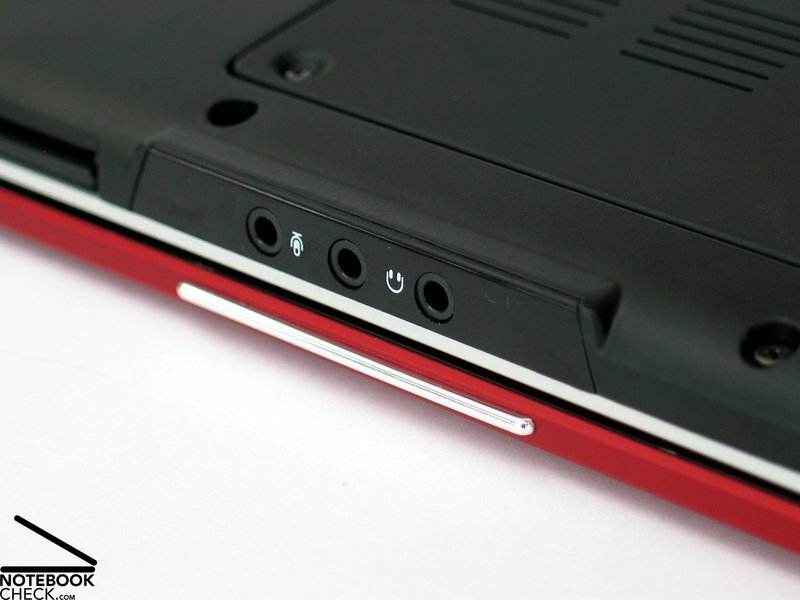 Only the audio ports (two for headphones, and a Mic-In) are at the center of the front edge. 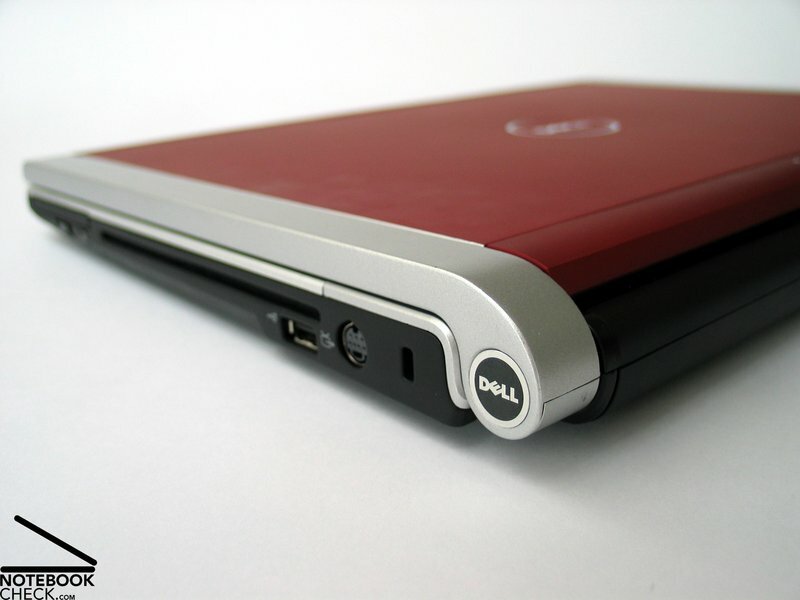 Instead of the 8xDVD+/-RW drive the reviewed notebook came with, the Dell XPS M1530 can also be equipped with a Blu-Ray drive. It makes storing up to 50 GB (dual layer) on a proper data carrier possible. 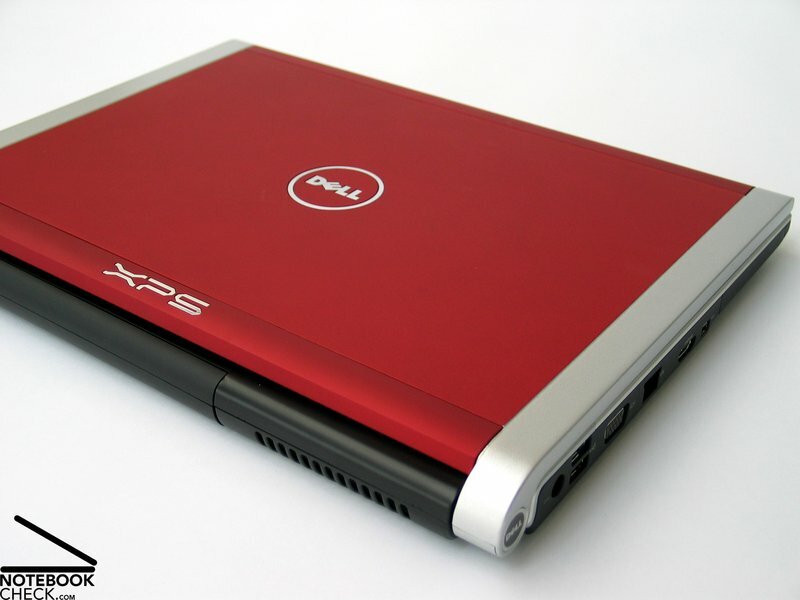 However, this version of the XPS M1530 currently costs 350.- EUR more. 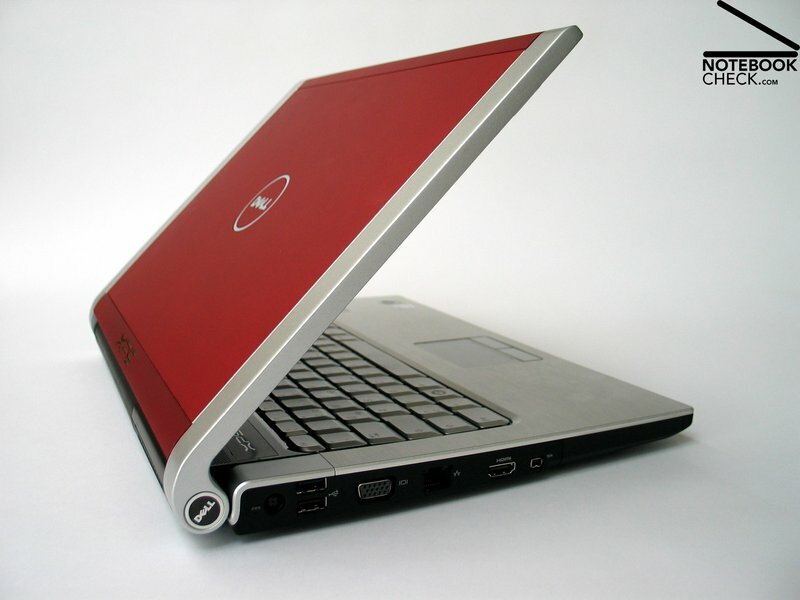 Alike other XPS notebooks, also the XPS M1530 provides an optional UMTS module. 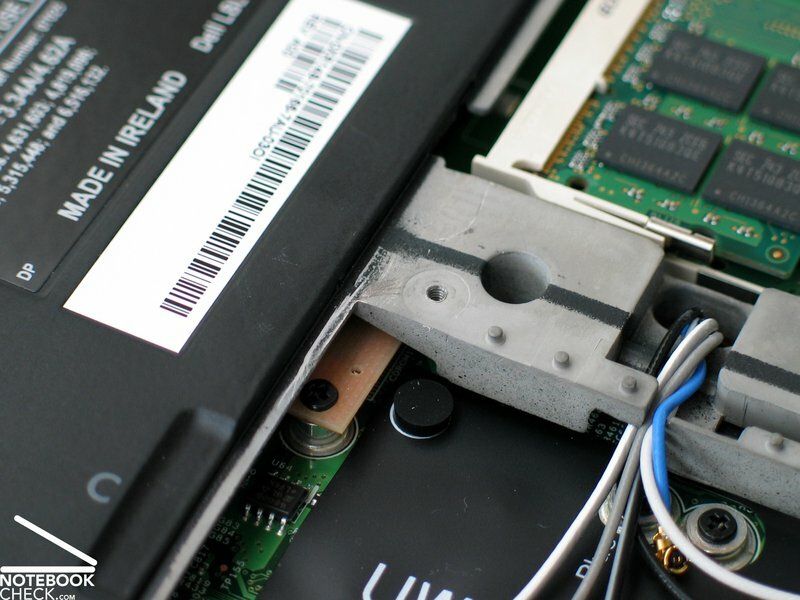 The slot for the particular, service provider dependent SIM card is located in the notebook's battery slot. 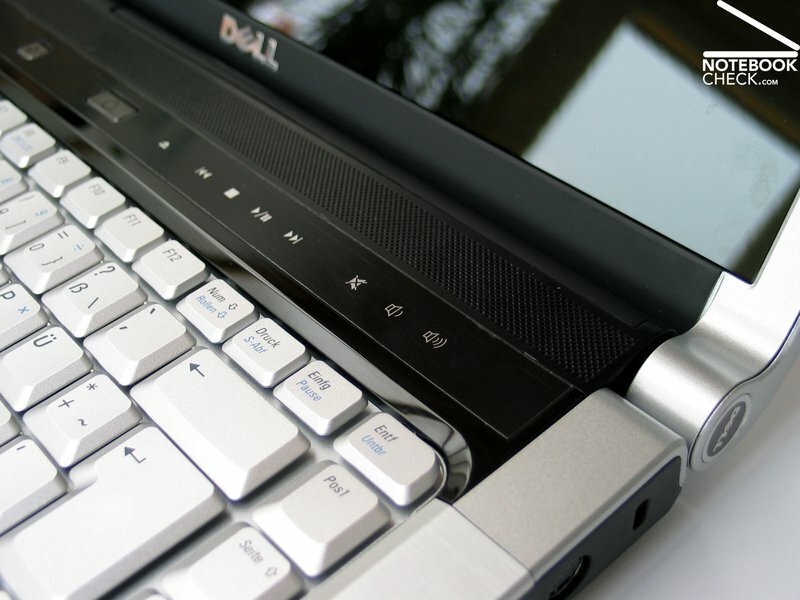 The color of the Dell XPS M1530's keyboard harmonizes well with its case. The keyboard is not especially structured, but, the size of the keys is alright. The enter key is especially big. The height of the keys in the last row, i.e., ESC, some F keys, Ins, and Del is a little bit smaller than usually. However, this did not cause any problems when using the keyboard. Typing felt good. The key feedback is clear, the end of the key travel is soft. If you apply force to the keyboard, it slightly yields. However, so little that it is acceptable. It just makes typing feel even more cushioned. The keyboard is absolutely user-friendly and proper for intesive typing. Its noise is even when typing faster low, you can just hear a quiet clicking. 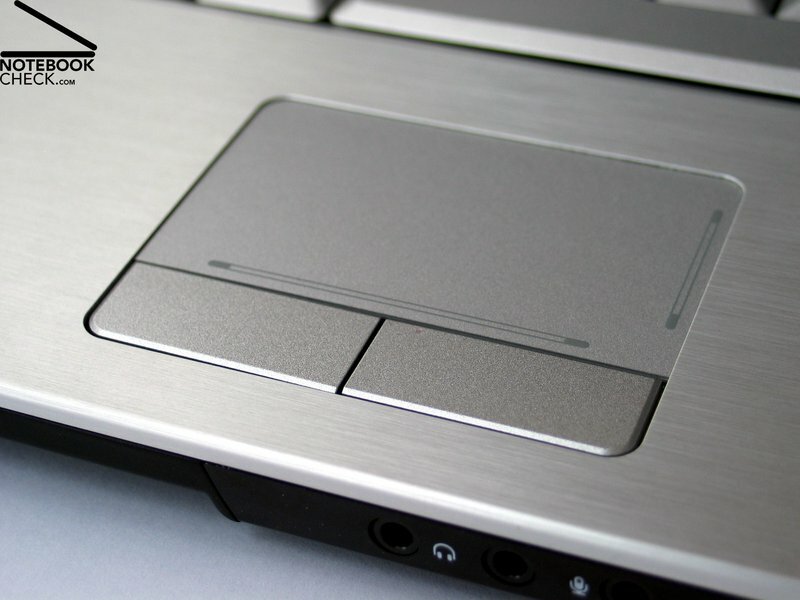 We liked the simple form of the touch pad, which harmonizes well with the look of the Dell XPS M1530. The edge to the surrounding aluminum cover is just perceptible. So, it's comfortable for the sliding fingers, and there is still adequate feedback about the position on the pad. Horizontal and vertical scroll regions are visually highlighted. Navigation by means of the touch pad was passable. However, it did sometimes not react immediately. We were especially pleased by the touch pad's fine surface and its buttons, because clicking felt soft and was hardly audible. 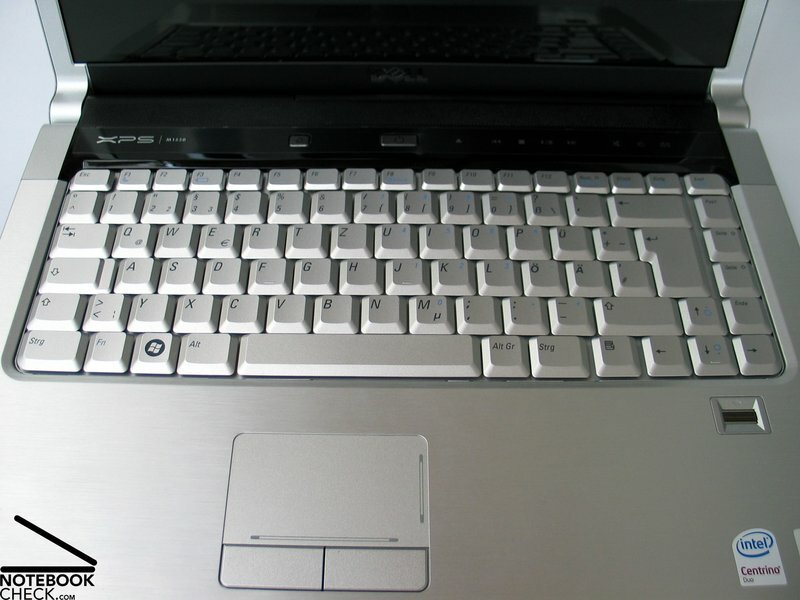 Almost all multimedia notebooks provide hot keys nowadays. And so does the Dell XPS M1530. They are located above the keyboard, have imprinted icons, and are touch-sensitive. Compared to touch-sensitive keys by competitors, you need to apply quite a lot of force in order for the keys to react. 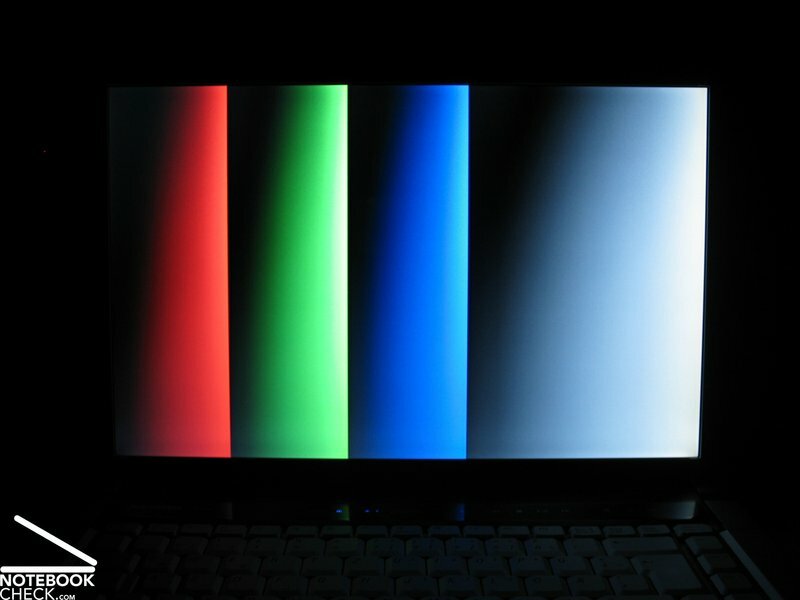 Reaction is signaled by a blue LED on each of the hot-keys. 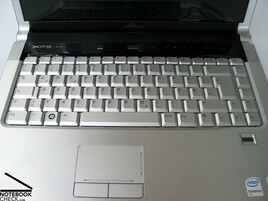 The hot-keys have the following functions: Ejecting the disk of the Slot-in DVD drive, Mediaplayer functions, and volume control. 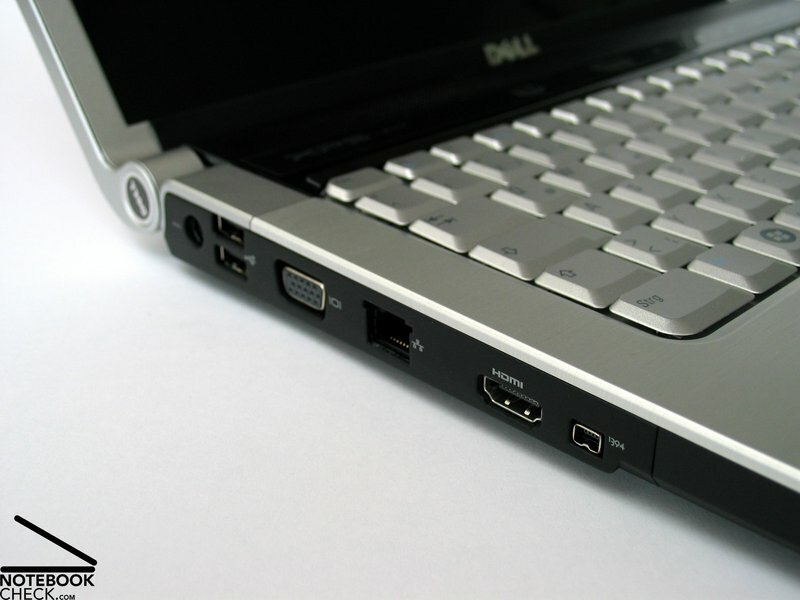 Left beside the power switch, there is another hot-key, which can be used to launch the Dell Media Direct Center, a software designed to handle multimedia elements, e.g., audio files, pictures, and videos, which can also be run without starting Windows Vista. Finally, there is also a hardware switch for controlling wireless communication and a hot key for displaying all available wireless networks. Both are located at the right edge near the front. 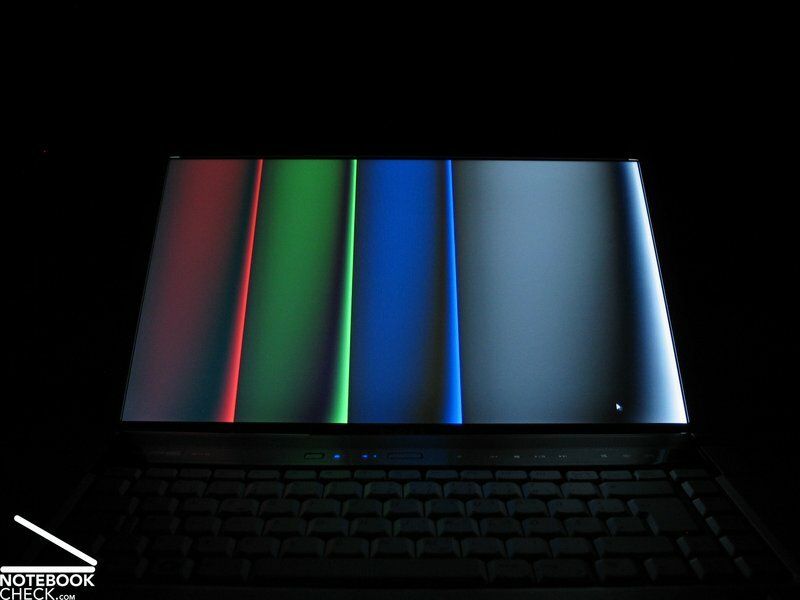 While the Dell XPS M1330 is available with a conventional display and LED background-lit screen, the XPS M1530 is at the time of writing only available with a single display version. It is a reflecting WXGA panel, called "UltraSharp CCFL display with TrueLife" by the on-line configuration tool. According to a Dell technician, a WXGA+ panel with CCFL technology and a LED display in WXGA format will be available soon. All of the offered panels will have a TrueLife surface. TrueLife refers to a reflecting surface, which unfortunately sometimes even causes annoying reflections indoors. We will discuss this aspect a little later. The maximum resolution of the WXGA display of 1280x800 pixels is currently standard. Those you would like to work with a number of applications at the same time, might need a bigger desktop and might be better off with a finer resolution. The maximum brightness of 172.8 cd/m ² was measured in the center of the display. The brightness diminishes near the borders, especially near the corners, whereas the measured minimum was 136.6 cd/m ². So, minimum and maximum differ by 20%. The average brightness of the reviewed WXGA panel is 148.8 cd/m², which is rather moderate. A black value of 0.75 cd/m² gives, combined with the good maximum brightness of 172 cd/m ² a calculated maximum contrast ratio of 230:1. Subjectively, the displayed picture looks good, with saturated colors, provided your viewing angle does not deviate to much from the ideal. In order to form an opinion about a notebook's mobility, it is important whether a notebook is fit for outdoor usage. 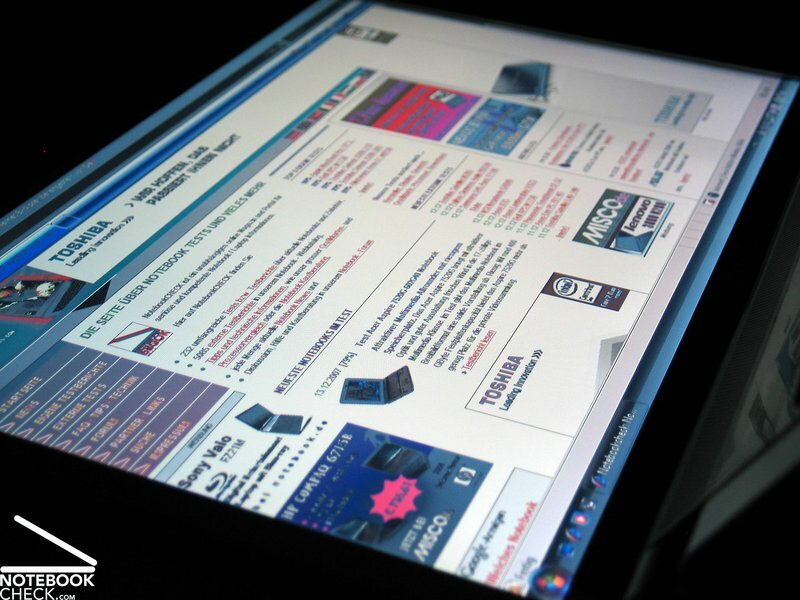 Here you have to consider two aspects, the brightness of the display and its surface. First of all the average brightness of 150 cd/m² is just sufficient for working outdoors. Regarding the second aspect, the Dell XPS M1530 is absolutely not fit for outdoor usage, because of its display's reflecting surface. If the environment is bright, you can even face reflections indoors (see video of display's viewing angles). If you try to work outdoors, you can rather use it as mirror than as laptop, because it reflects outdoors even in moderate bright environments. To summarize it, we won't recommend to use the XPS M1530 outdoors, though other magazines do. Another weakness of the display are the relatively narrow viewing angles of its WXGA display, especially vertically. Even when working at a fixed place, we had to readjust the opening angle again and again, because you'll even face an annoying darkening respectively whitening, if you are just a little out off the ideal viewing angles. Horizontally, the picture does not change that dramatically. However, at acuter angles, you may reckon that there will be color changes, reflections, and a loss of contrast. Because the Dell XPS M1530 is considered a beginner's gaming notebook, there are of course a number of configuration options available. Regarding processor, Dell offers 4 versions. 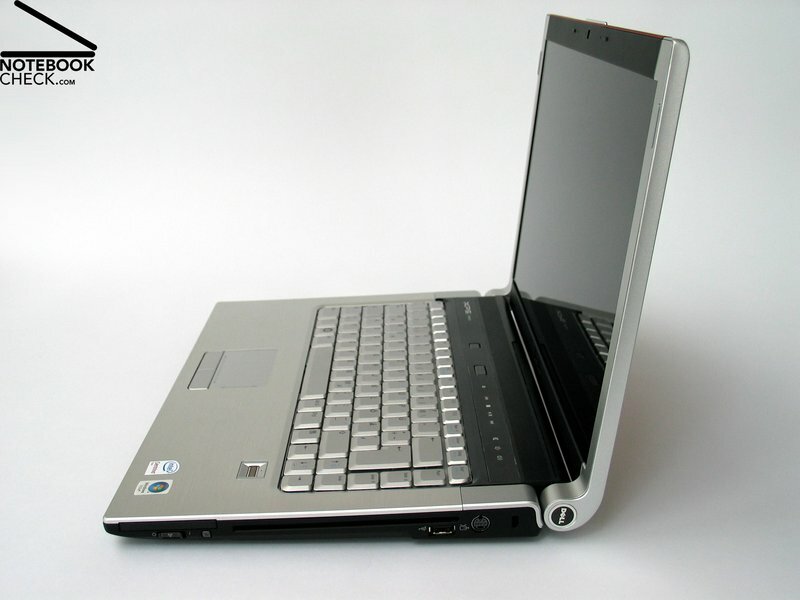 First of all, there is low-cost version, an Intel Core 2 Duo T5250 CPU with 1.5 GHz, a good configuration for beginners. If you focus on powerful gaming and application performance, you should, however, at least choose a T7250 CPU with 2.0 GHz. The price/performance ratio of the later is ideal. 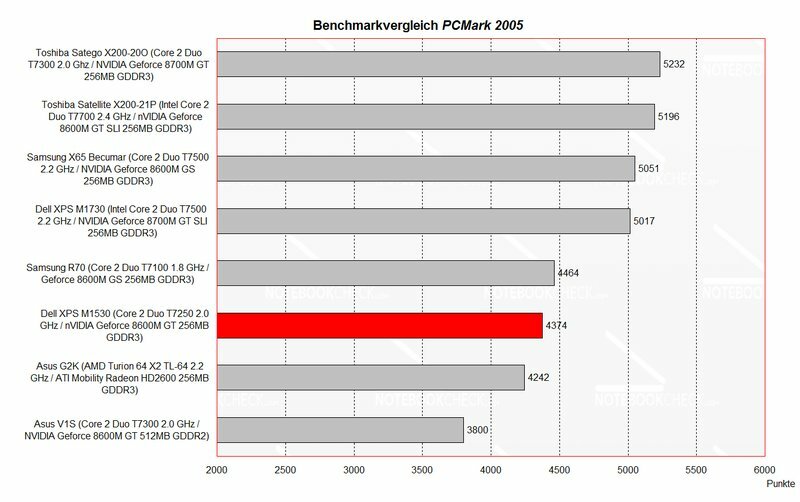 The T7500 and the T7700 with 2.2 respectively 2.4 GHz are even more powerful, but, also even more costly, e.g., the T7700 costs about 339,- EUR more than the T5250. Nonetheless, these Core 2 Duo processors guarantee first-class performance in any case. Regarding graphics the user can also choose between two versions. The first one, the nVIDIA Geforce 8400M GS graphics adapter with 128 MB dedicated video memory, is alright for multimedia and office applications. For those who like computer games - the actual target group of the Dell XPS M1530 - , the second versions, a nVIDIA Geforce 8600M GT with 256 MB GDDR3 memory, will be the graphics adapter of choice. Already the 3DMark 2005/2006 benchmark test proves the performance of the reviewed video solution (driver version 7.15.11.5663) and makes reserve capacities obvious. 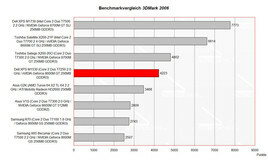 The Geforce 8600M GT with GDDR3 memory clearly outperforms the identical video card , but, with GDDR2 memory of the Asus V1S. 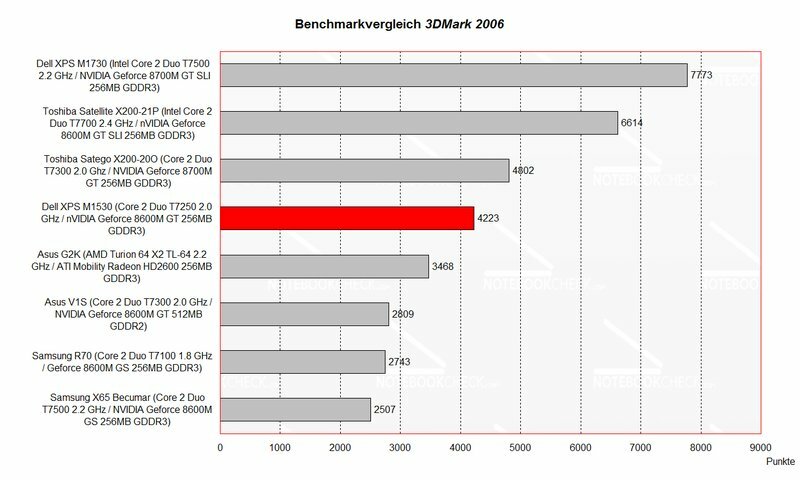 In the 3DMark 2005 and in the 3DMark 2006 benchmarks the performance of the built-in Geforce graphics adapter is already very close to the performance of the Geforce 8700M GT video card of the Toshiba Satego X200. 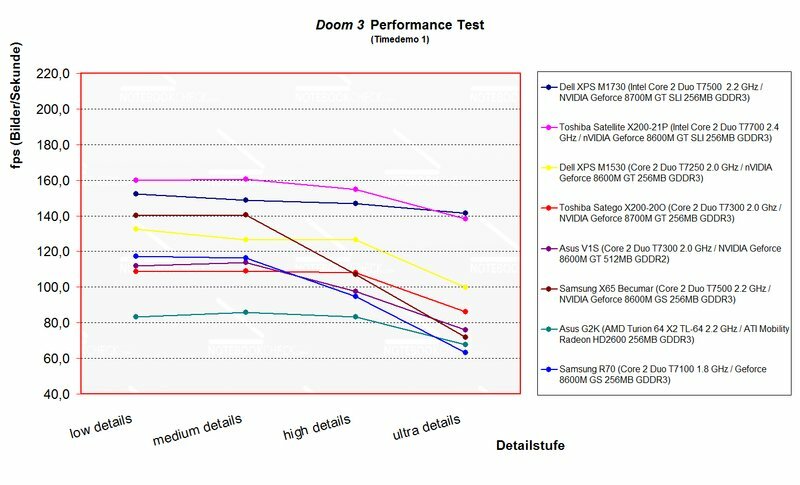 The results of the Doom3 and F.E.A.R. benchmark test were also convincing. 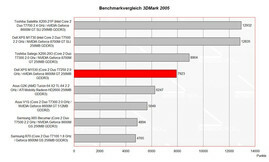 The Dell XPS M1530 is third, behind the two SLI solutions (8600M GT SLI, 8700M GT SLI). It even clearly outperforms the 8700 M GT video card of the Toshiba Satego. 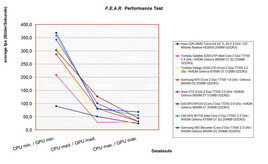 The results of the DirectX9 Ego Shooter FEAR are similar. The Samsung X65 and the Dell XPS M1730 perform marginally better. 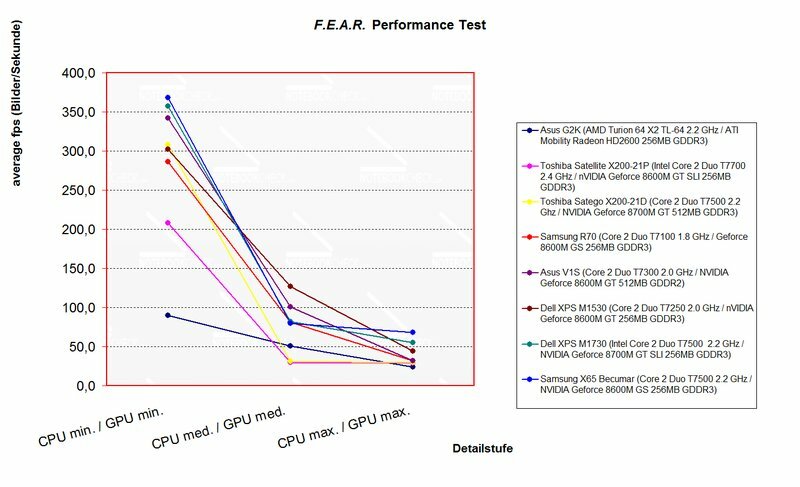 The XPS M1530 is once again third, whereas the good performance with medium CPU and GPU settings attract special attention. Of course the DirectX10 performance of the Dell XPS M1530 is also of great interest. 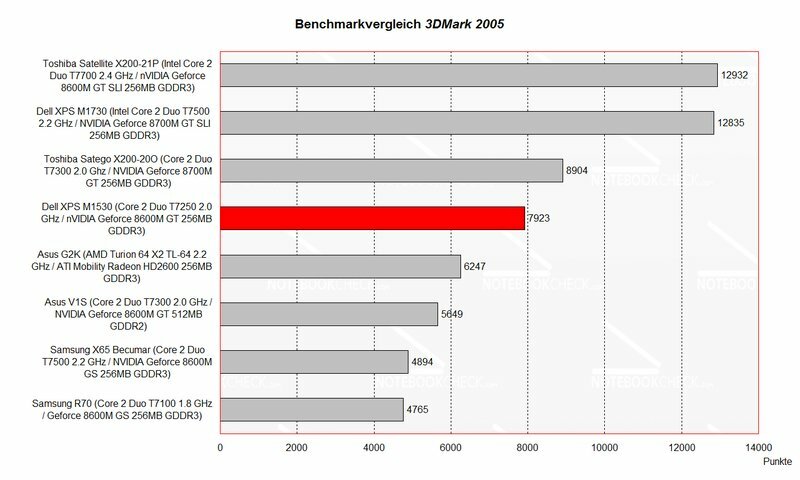 The results of the Crysis benchmark test allows two conclusions: First of all that the 8600M GT is not especially designed for DirectX10. Secondly, that video cards with GDDR3 have first-class performance. 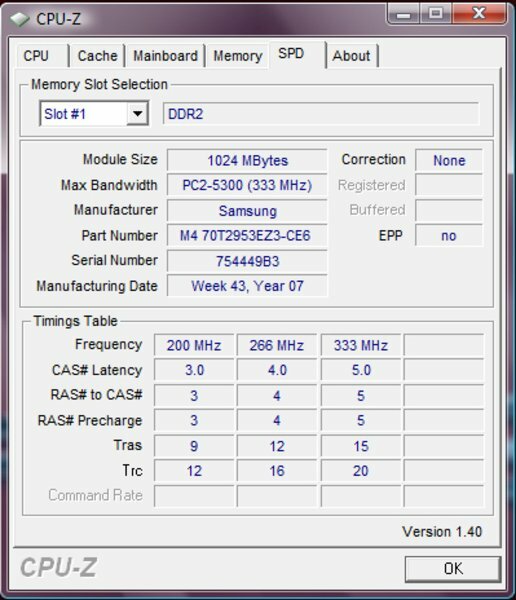 The Zepto 6224 W with 8600M GT graphic, but, 512 MB DDR2 VRAM is clearly second. 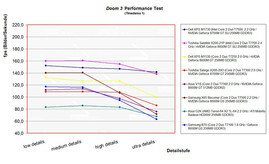 The ATI HD 2600 in the Asus G2K is clearly outperformed by the XPS M1530. 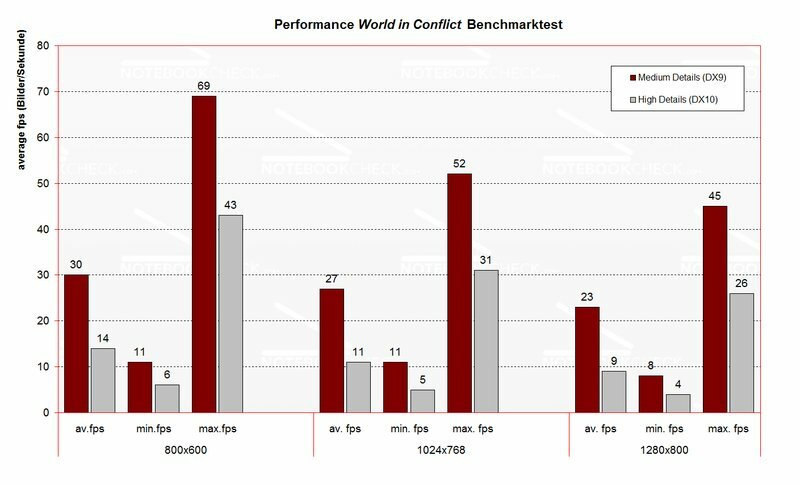 The benchmark results of the strategy game " World in Conflict ", which also supports DirectX10, are rather disillusioning. Especially at "high details" (DirectX10) the achieved frame rates are far from granting gaming joy. 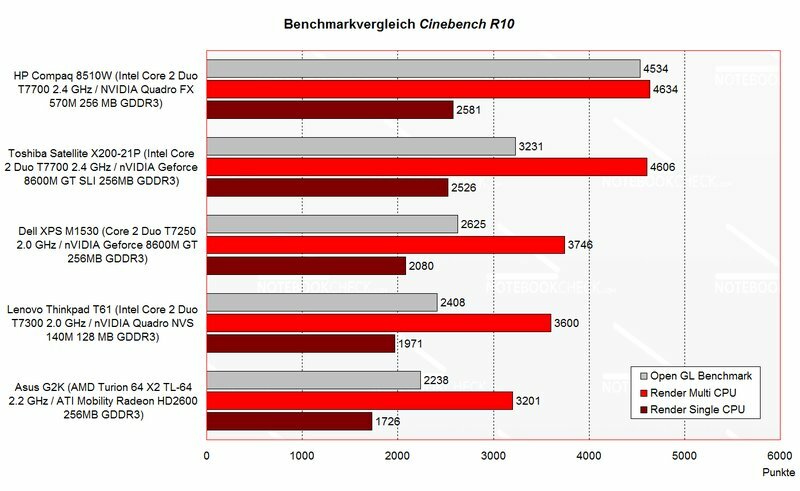 However, in practice (2v 2, 1280x800, medium details) the performance of Dell XPS was quite alright, whereas we measured 40-50 Fps. The game ran without problems under these settings. But, if there are more players, a lot of animations, like explosions and wads of smoke, the performance will of course decrease and you might face flickering. Following we tried two current games, Need for Speed pro Street and another ego shooter: Call of Duty 4- Modern Warefare. 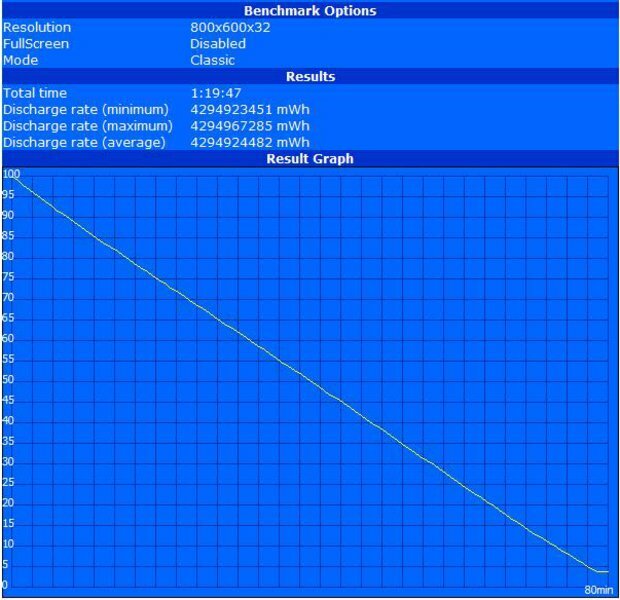 During a race with a BMW M3 E92 through the deserts of Nevada at a resolution of 1280x800 and with low details, and anti-aliasing turned off, we measured an average of about 50 Fps. Increasing the details to medium or high, led to a performance loss. Only 30 Fps were possible with these settings, so, it got difficult to play the game. When playing a scene of "Call of Duty 4", a fight in the streets of a besieged Russian town, we measured 30-40 Fps on average, whereas the resolution was 1280x800, details standard, and AA off. Overall, the game is therewith playable. 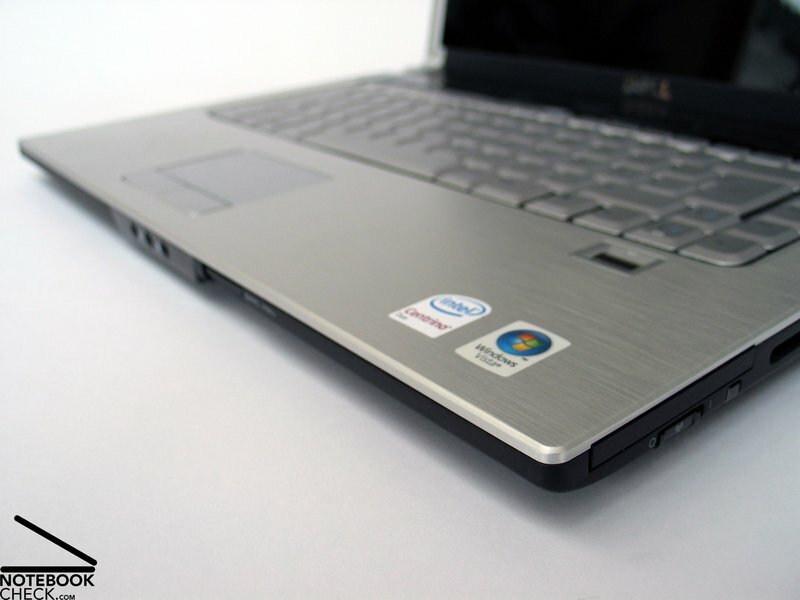 Summarizing it, the gaming performance of the Dell XPS M1530 is good, so, it is a good choice when you are looking for a 15 inch gaming notebook. This is especially proved by the direct comparison of the built-in graphics adapter to other solutions. A further positive aspect is, that most of the games (expect of DirectX10 games) can be run at the native resolution of its display (i.e., 1280x800), so, the quality of the images are not affected by interpolations. 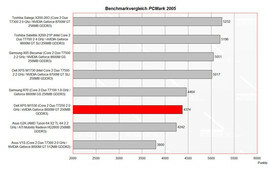 According to the PCMark 05 result, the application performance of this notebook is average. 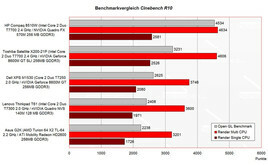 Comparing its Cinebench results to other notebooks, it is also average, which is the same level of, e.g., the Lenovo T61. 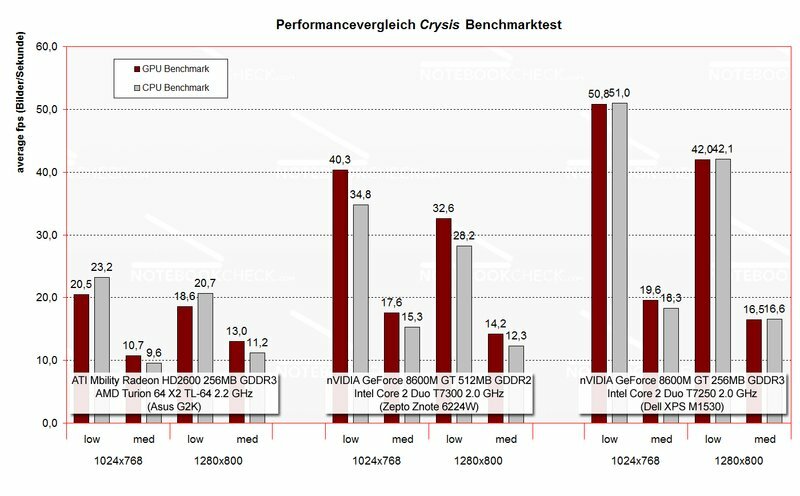 Furthermore, this indicates that the performance of the reviewed XPS M1530 (T7250 CPU, 8600M GT graphic, 2 GB of RAM, 160 GB/5400 HDD) is more than sufficient for office and multimedia applications. The reviewed XPS M1530 was equipped with a hard disk with a revolution speed of 5400 revs/min by Seagate. Its transfer rates are good compared to competitors of the same class. 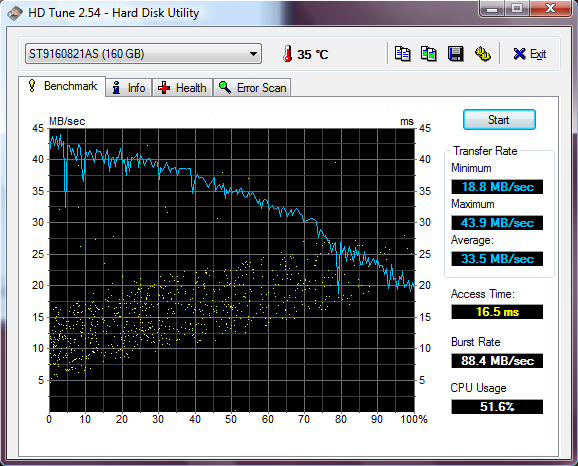 The low access time of only 16.5 ms, is nearly comparable to that of 7200 revs/min hard disks. Again Dell surprised us regarding this aspect. 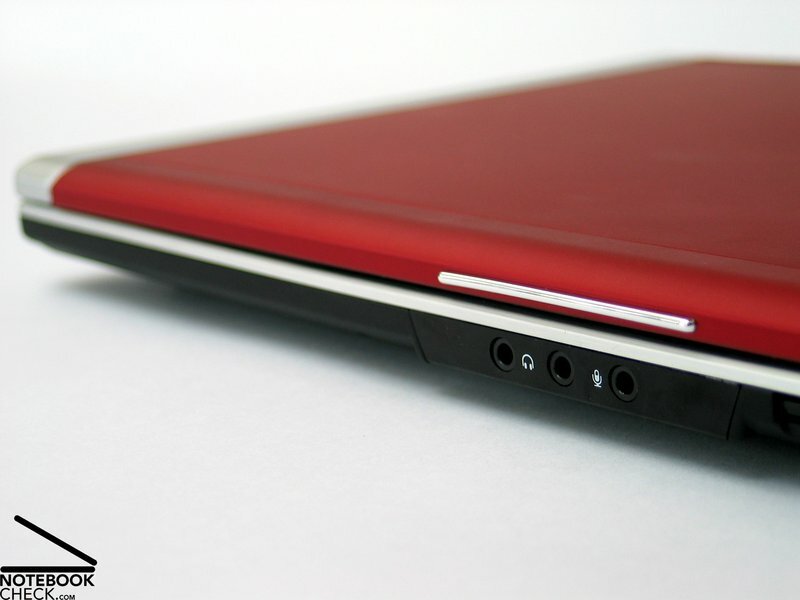 The XPS M1530 is again very quiet considering its first-class performance. 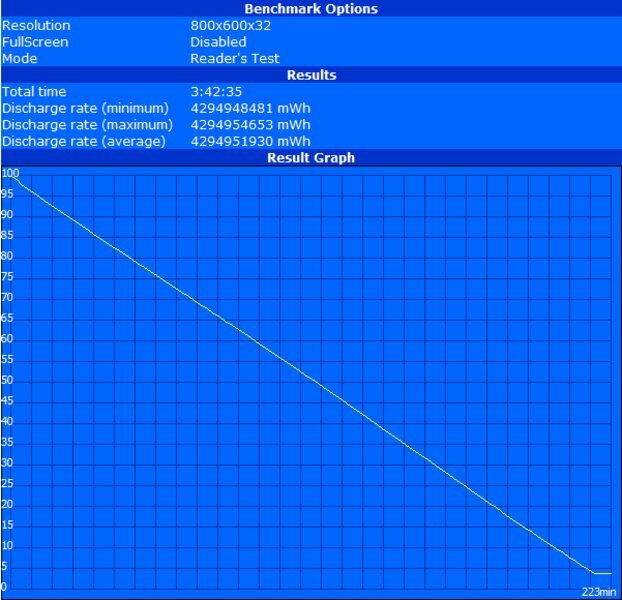 In the idle mode (energy profile balanced) the notebook computer the noise level is most of the time not more than 34.8 dB, measured in a distance of 10cm, which is about the position of the head). The fan stays deactivated most of the time and you can merely hear the noise of the hard disk. Sometimes, the fan ran for a short time. So, if you'd like a nearly absolutely silent notebook, you should go for the Solid State hard disk (SSD), if you can afford it. Under load the fan starts running, whereas the noise level is 39.5 dB at its lowest revolution speed. When playing games, we measured a maximum noise level of 42.2 dB. Subjectively, the maximum noise level is clearly audible, but, also tolerable. The noise is such high, when playing computer games. However, the concentration on the game and the sound of the game will surely attract more attention, so, the noise of the fan gets not too obvious. More than this, the noise of the DVD drive is annoying, which loudly clicks, when reading a CD/DVD. The clearly too high noise level of 49.9 dB measured during DVD back is about as high as during data transfer from the DVD. 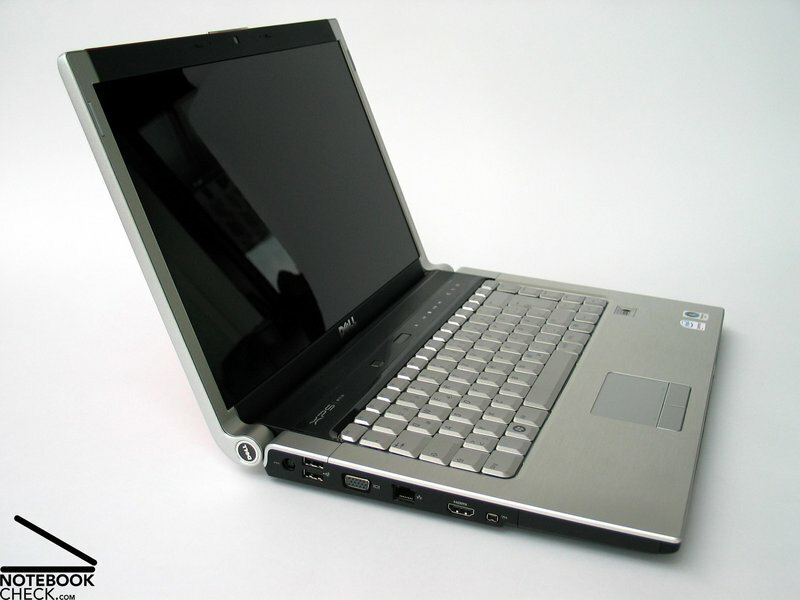 When playing DVD via Media Direct Center (without starting Windows), the noise level was only 39.9 dB, which is an average noise level of DVD drives of this notebook class. Regarding temperature emissions, measured contact-free by means of an infrared thermometer, the Dell XPS M1530 rates very well. The temperature of the top side increased only slightly, whereas we measured up to 35.6°C. Basically, because of the aluminum parts, the temperature is rather evenly distributed on the top side. The temperature at the bottom side is similar to the top side. Here we measured a good maximum of 36.6° Celsius. The temperature is again evenly distributed and also hot spots are due to aluminum chassis avoided. Regarding temperature emissions the notebook is therewith absolutely fit for mobile use. The sound of the two speakers, located left and right above the keyboard is overall acceptable, however, the basses are weak. At an average volume level the sound is alright for listening to music. However, approaching maximum volume, the sound quality worsens. 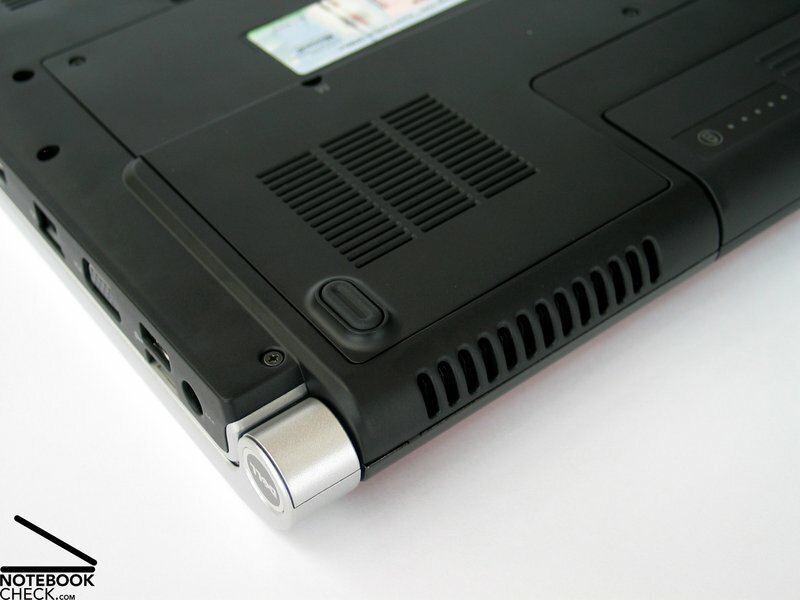 We were pleased to find two headphone ports at the front of the XPS M1530, because it allows two persons to listen to music at the same time. The sound output of the 3.5 mm stereo jacks was with alright. 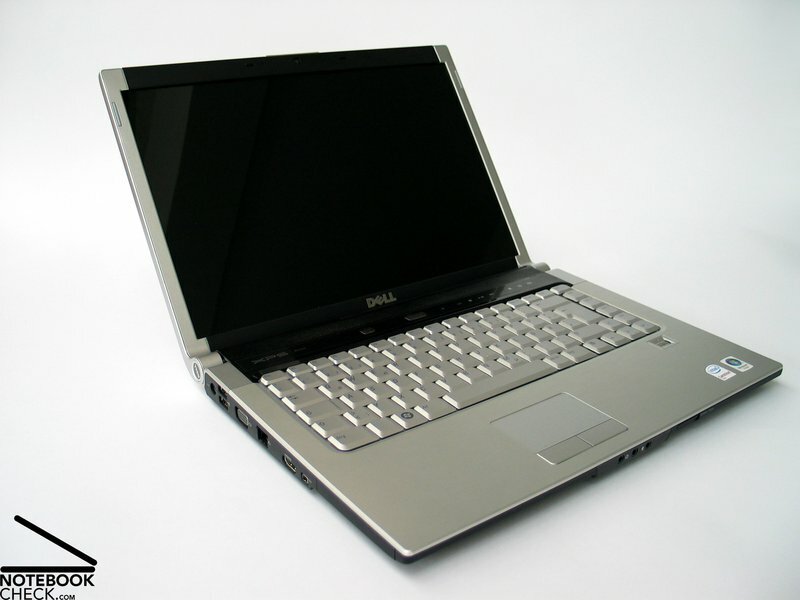 The reviewed Dell XPS M1530 was equipped with a 6 cells lithium ions battery with a capacity of 56 Wh. A 9 cell battery with a 85 Wh capacity is available for 30 EUR extra charge. For increased mobility, this options is definitely worth consideration. Because of the opening mechanism of the display, which folds open across the battery to the back, the bigger battery's height had to be increased, so, that it is possible to put 9 instead of only 6 cells into it. This move the back edge of the notebook upwards, so, that it is in slanting position afterwards. The measured battery runtime of the 56 Wh battery ranges form about 80 minutes under load to a maximum of 223 minutes in energy-saving mode (minimal brightness, wireless functions off). The runtime during DVD playback was only 85 minutes (profile: balanced, maximum brightness). 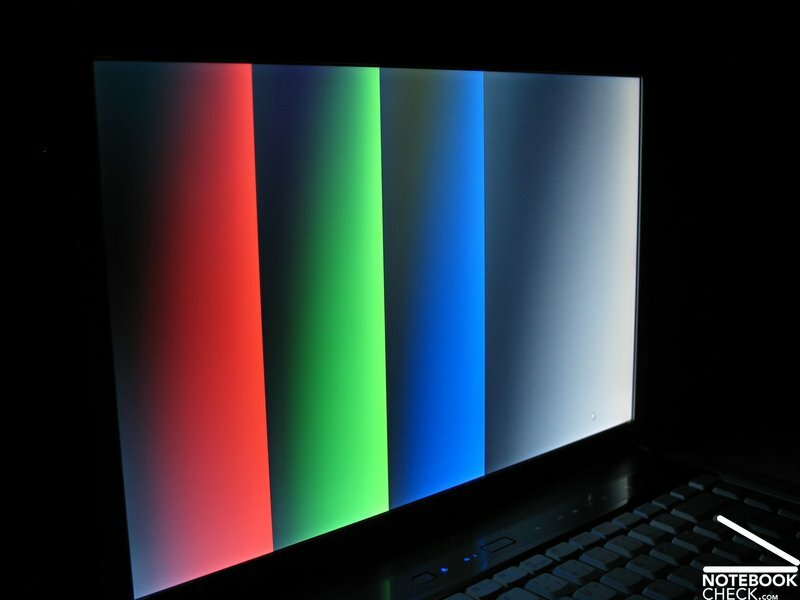 When watching DVDs in energy-saving mode, the picture flickers. The rating of the runtime is clearly better in practice during WLan operation. In energy saving mode, it is possible to work about 3 hours unplugged. Although we would still recommend the 9 cell battery for intensive mobile work, this runtime allows reasonable mobile work with the 6 cells battery possible too. The Dell XPS M1530 is an elegant and compact multimedia notebook with first-class performance, but also smaller weaknesses. The case scores points by high-quality materials. Aluminum parts used for display and base unit contribute to good haptics and excellent stability. Despite of the overall high-quality impression the case left, there are some smaller weaknesses regarding workmanship, e.g., uneven gaps at the hinges, and sloppy gaps next to the battery. Typing with the keyboard is user-friendly. 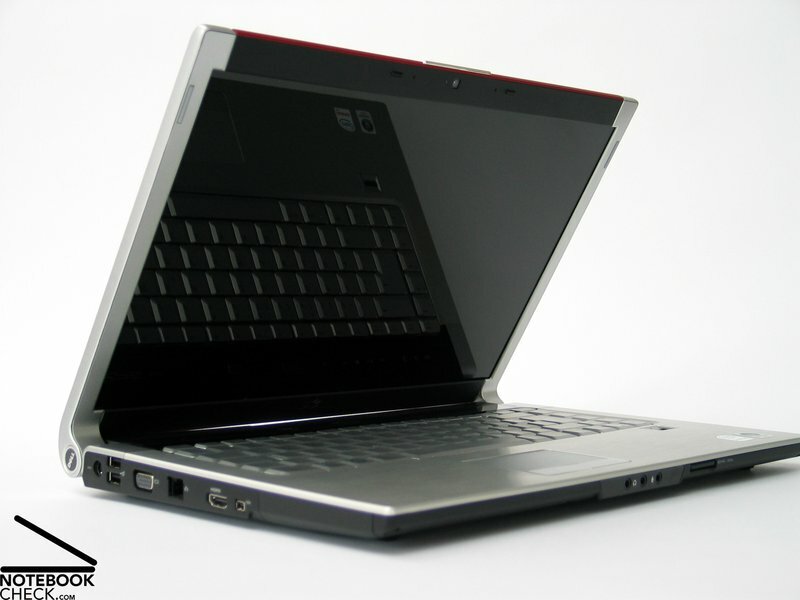 Its and the touch pad's design harmonizes well with the total look of the notebook. Overall the working with the touch pad was alright, however, there it did not always react well. 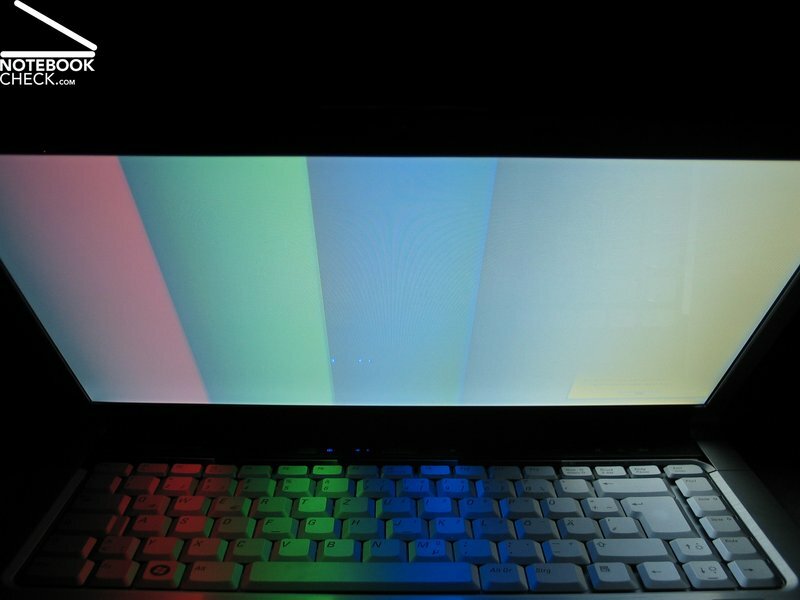 The reflecting WXGA display's brightness and illumination are average. However, the viewing angles are rather narrow. 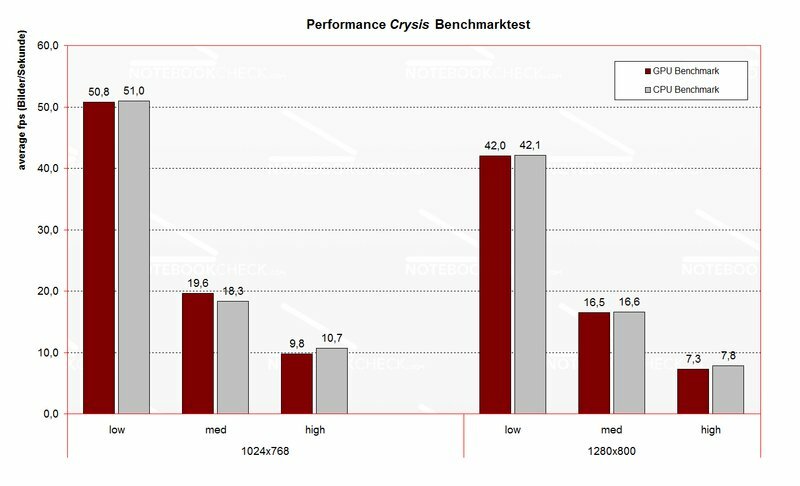 The XPS M1530 scores points in the benchmark tests. 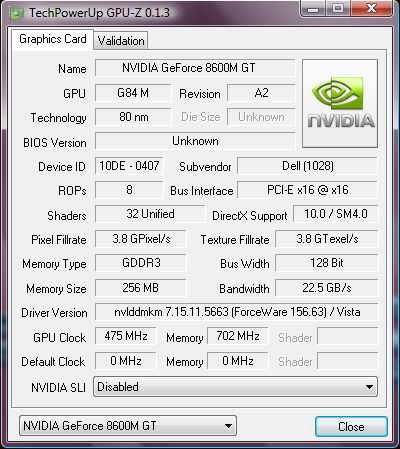 Its performance is even proper for current games, expect of those supporting DirectX10. 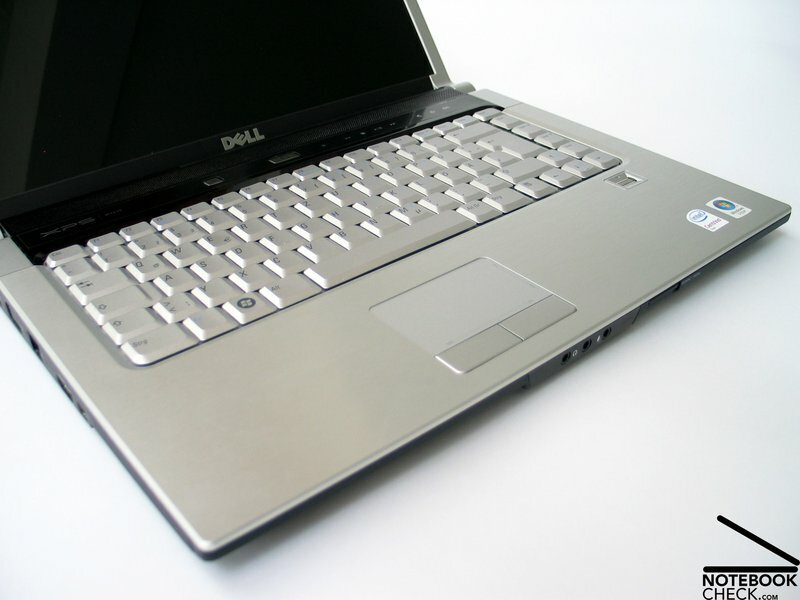 Directly compared to similarly equipped notebooks, the XPS M1530 is still first-class. We were also pleased by its low noise emissions in idle mode. Still providing sufficient reserve capacities, the noise is pleasantly low when browsing the Internet or processing texts. When playing games, the noise emissions aren't that obvious anyway, as you focus on the game. The surface temperature is also always alright, so, proving the XPS M1530's good temperature control. The battery runtime is good too. However, for intensive mobile use, you should, however, consider the 9 cells battery. 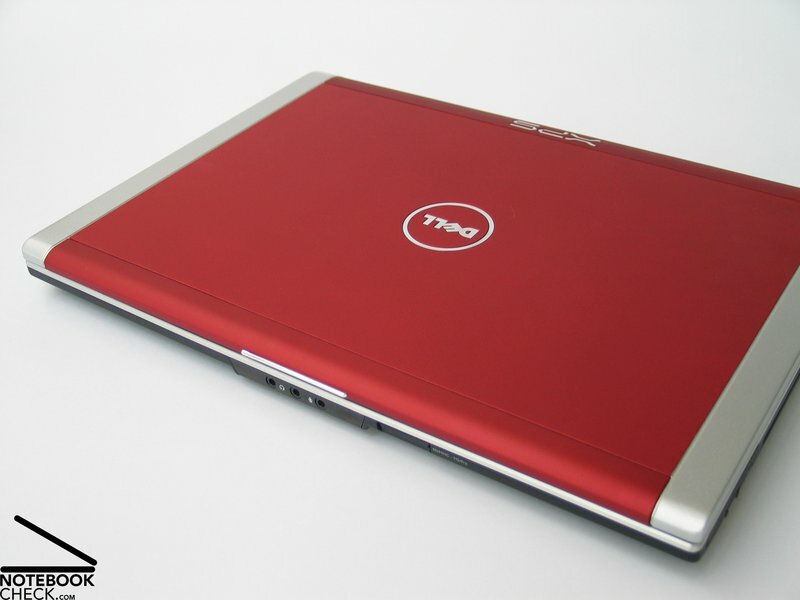 The reviewed Dell XPS M1530 came with an elegant red lid. 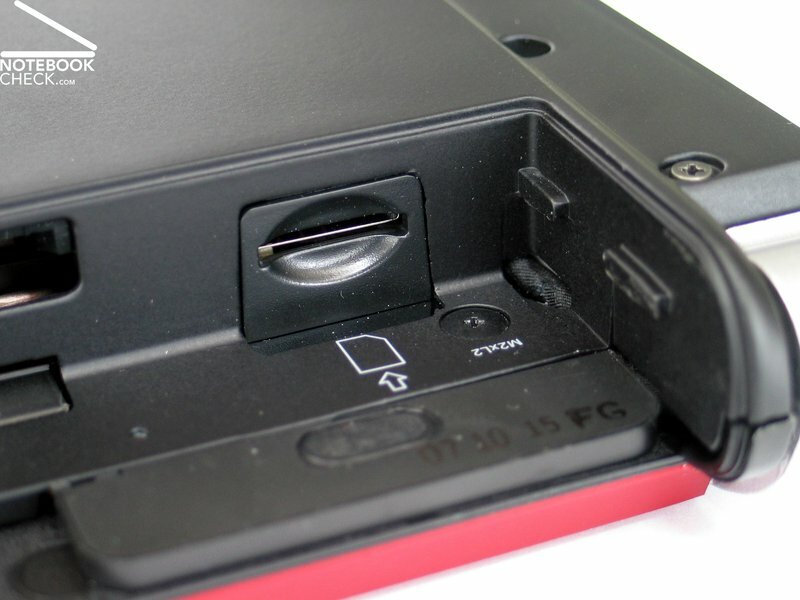 Next to the battery slot, there is an UTMS slot. 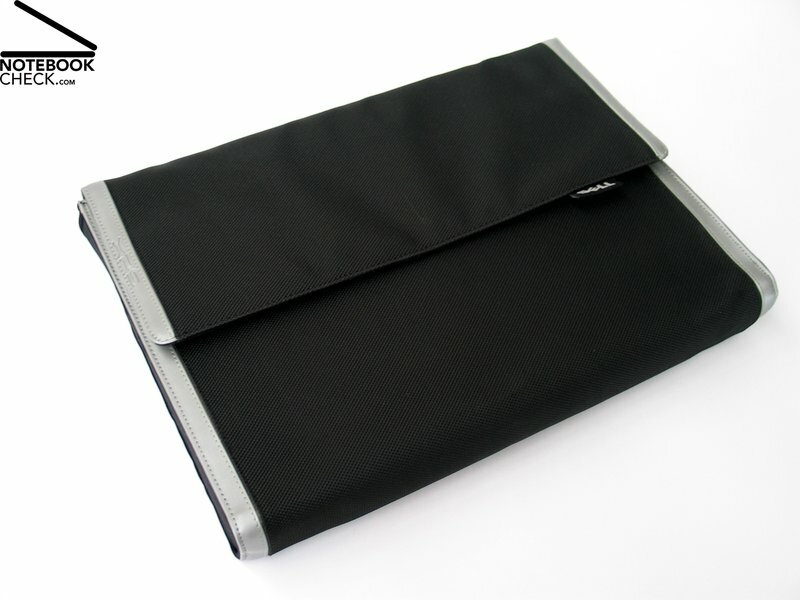 Among a lot of accessories, there is also an elegant notebook bag. 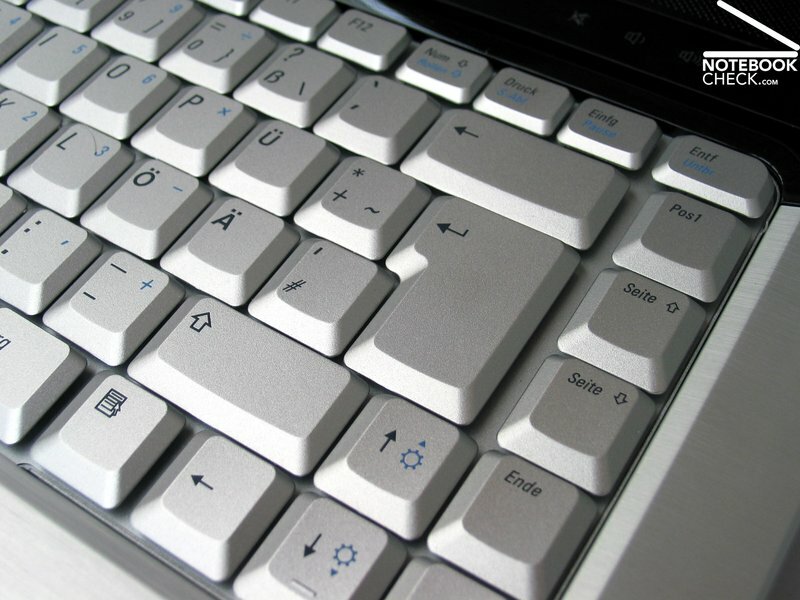 The hot keys above the keyboard are elegantly designed. 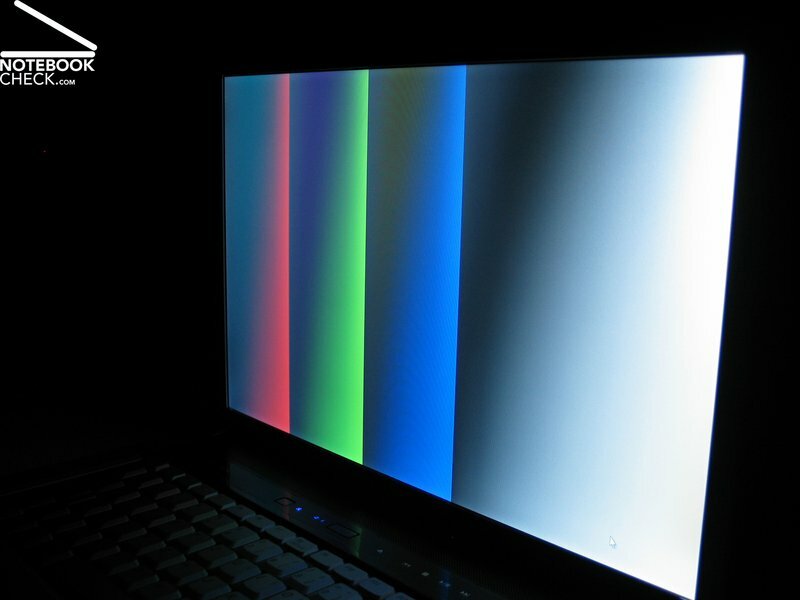 Brightness and illumination of the 1280x800 resolution WXGA display are average. 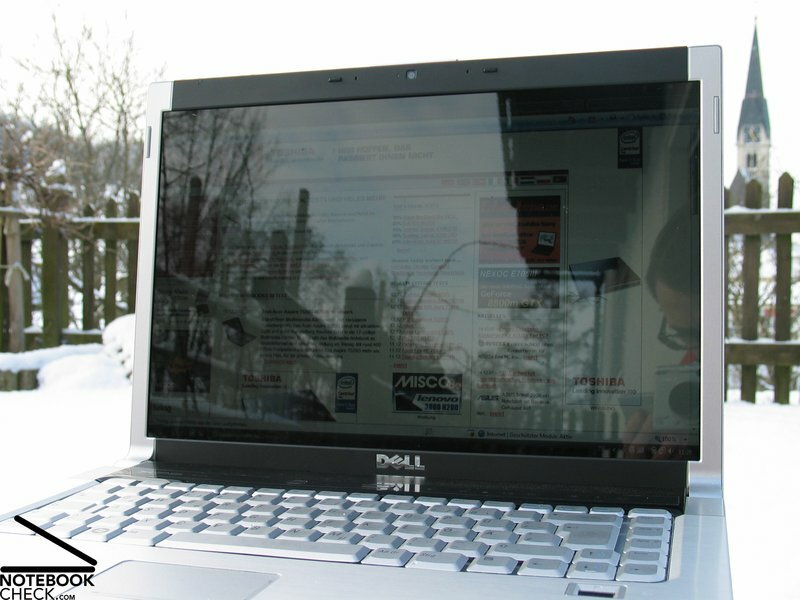 Its hardly possible to use the notebook outdoors, because the display's reflecting surface. The viewing angles are that narrow that you need to adjust the opening angle time and again. 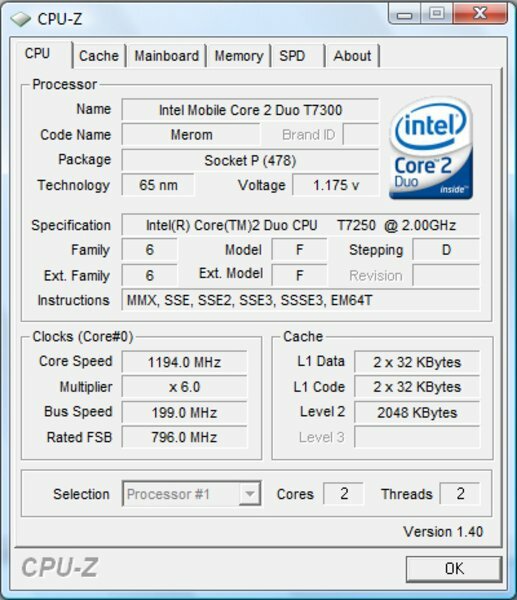 Intel Core 2 Duo processor and nVIDIA Geforce 8600M GT provide first-class performance. 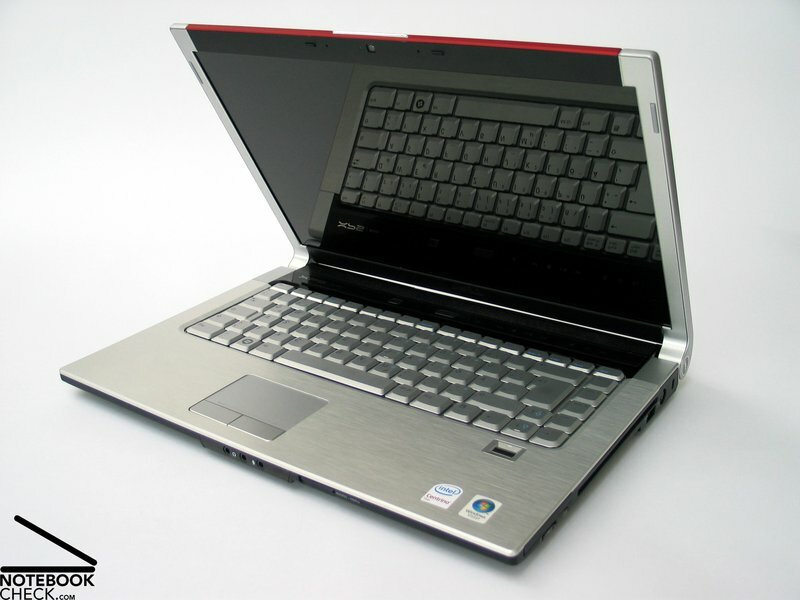 Due to GDDR3 video memory, the M1530 could outperform similarly equipped notebooks. Here the stable metal construction is depicted from the inside. Despite of the good performance, the noise emissions were low in idle mode. The surface temperatures stay always alright. Though the basses are weak, the sound of the speakers were good. Furthermore, the M1530 comes with a hardware switch for controlling wireless communication. In the display frame, there is a 2.0 mega pixel web-cam provided. 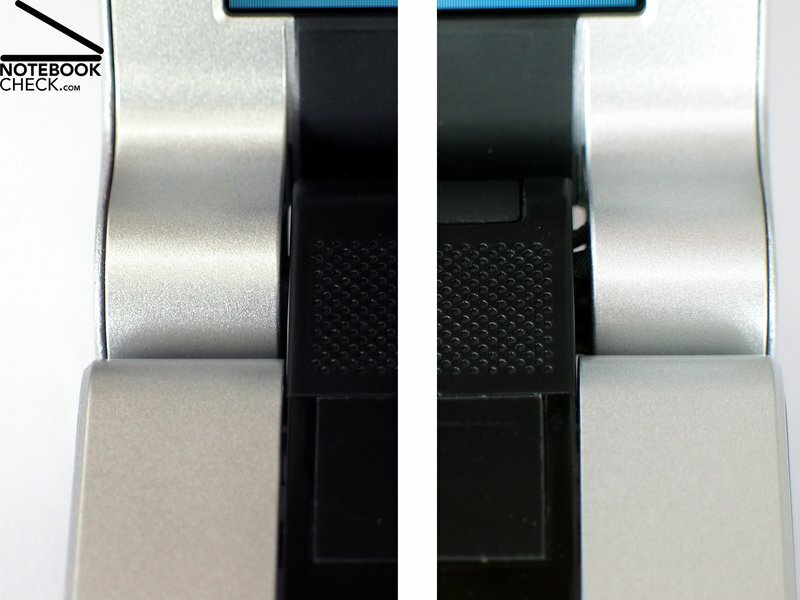 The slot-in drive can also be equipped with blu-ray technology. ... support the elegant look of the notebook. High-quality materials with good haptics were used. E.g., at the palm rest areas a brush-finished aluminum part was used. The trough is made of aluminum and magnesium. Overall, the workmanship is alright. However, scrutinizing the case, you'll find some sloppy gaps. The stability of the case is very good. stability and durability of base unit and display. ... there are Firewire, VGA, S-Video, and HDMI port for digital video and sound output. Generally, the order of the ports is good. However, the audio ports are located at the front edge. 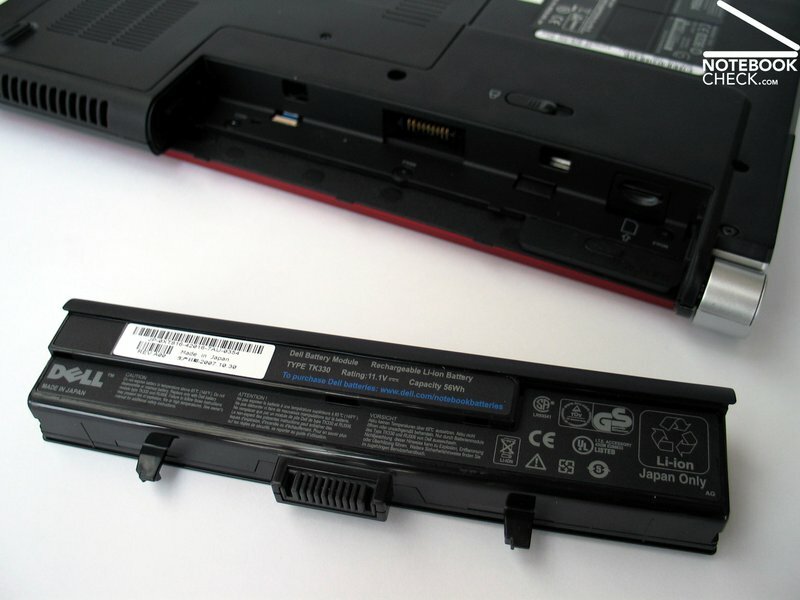 The standard 6 cells battery can be replaced by a 9 cells battery.